Shot blasting machines come in various sizes, models and have different applications for different cleaning and peening purposes. If you have small to medium size components or metal parts that you want to clean through shot blasting process in bulk or small batches then Tumb Type Shot Blasting machine is the most suitable for the task. A tumblast type shot blasting machine starts @ Rs. 2.25 lacs has a special rubber belt having anti-abrasive property arranged as a cradle receives the metal parts to be treated and with is movement the metal parts are in constant tumble. When in operation the metal pieces are hit by a continuous spray of jet abrasives propelling at high speeds achieved by a centrifugal wheel connected to an electric motor. Loaded parts receive a uniform shot blasting treatment on all the sides and every corner as they continuously change position due to the moving rubber. It is ideal for cleaning and reconditioning of automotive components such as brakes, gears, and shock absorbers – The blasting treatment carried on such components allows the removal of residual deposits of oxidation and combustion. Removes earth and dust accumulated during years of use allowing recovery of the components. Idea for Shot-peening purposes of spring and mechanical elements – The shot blasting process allows compressing the surface layer of springs and mechanical elements built to resist to frequent alternate stress thereby increasing the fatigue breaking strength. Cleaning and deburring of Casting Components in Foundries– Almost all the foundries have tumble type shot blasting machine to remove the ceramic layers deposited on the casting components. The ceramic layers are crushed by the abrasives hitting against the ceramic layers at high speeds and the casting component is free from the layers and is superbly cleaned due to the impact of the high velocity shots. Highly effective in Cleaning of tools – Welding residues and deposits are removed effectively from the surface of the tools by the shot blasting process. It is also very effective in cleaning the deposits that form on the surface of the tools after the heat treatment. Before coating the surface shot blasting is carried out to make the surface more porous to allow better absorption of the coating material by the surface of the tools or metal parts. Deburring of Forged component and Machined Components – Shot blasting allows deburring of forged components and machined components by removing the burs or uneven surfaces that form during the forging process or machining of the metal components. Having experience of over a decade in the shot blasting industry and over 2 decades in automobile OEM environment our expert designers and technicians manufacture each shot blasting machine using the highest quality of raw materials and equipments. Combining our experience, expertise and commitment to the quality makes us the leading manufacturer of Tumb type shot blasting machine in India. 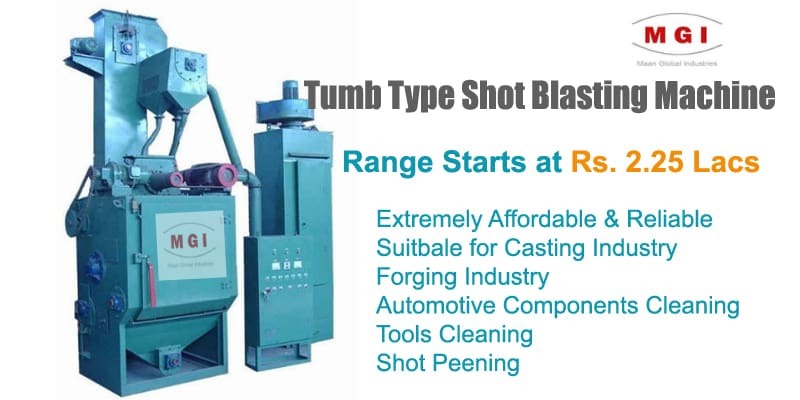 Range of Tumblast Shot blasting machine starts from Rs. 2.25 lacs and goes upto 15 lacs depending on your requirements and nature of job. Copyright © 2019 Sandblasting Machines Manufacturer India.